It is the only new activity on the site since the VA took ownership of the property in 2014. The VA owns 512 acres zoned “Nature Reserve” that can never be developed and 112 acres where they propose building a clinic and columbarium. In 2016, the VA received over $80 million from Congress to begin work on a health facility and national cemetery on its 120-acre development area, which is located where the Antiques Faire is held each month. 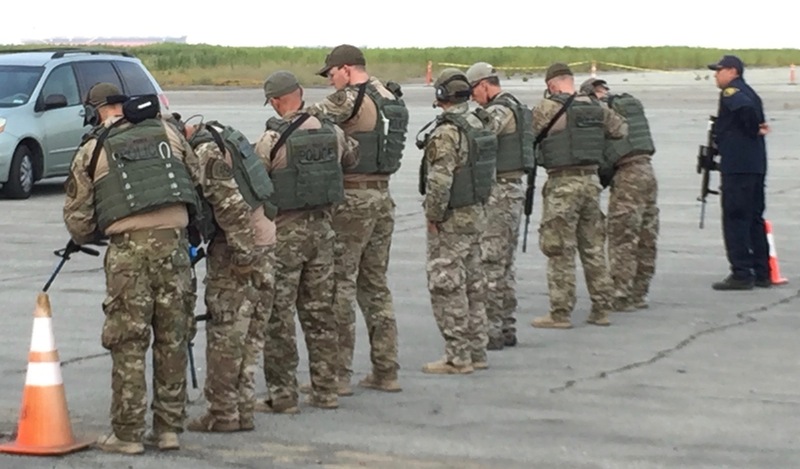 The two-day exercise on Sept. 8-9 was called “Dignitary Hostage Rescue” and conducted on the Nature Reserve. Another training exercise was conducted on and around the USS Hornet Museum, as well as at locations around the county. The command center for the hostage rescue exercise on the Nature Reserve was set up inside the gate near the old Air Traffic Control Tower on Monarch Street. At 7:50 a.m. Sunday morning, a nine-person tactical team was issued their automatic weapons and special magazines for firing blanks. They boarded a van and followed the armored vehicle to the exercise area next to an old bunker not far from the West Wetland. An AC Transit bus was parked there as part of the scenario. Gunfire ensued. The Nature Reserve area is utilized not only by the least terns during their nesting season, but also by countless bird species throughout the year. The area also features two wetland areas and random grassland scattered amongst the nearly 300 acres of pavement. The area is off limits to the public, with no timeline for ever opening a link of the Bay Trail. The training exercise took place on the area where the Bay Trail has been proposed. Urban Shield is a regional training program sponsored by the Alameda County Sheriff’s Department. In March of 2018, the Alameda County Board of Supervisors voted to end the training program as it is now organized. The vote came after years of community opposition saying that the program promotes racist stereotypes and militarizes police departments. U.S. Fish & Wildlife Service apparently acquiesced to the prohibited use, even cancelling its volunteer work at the least tern colony that is located a quarter mile away. 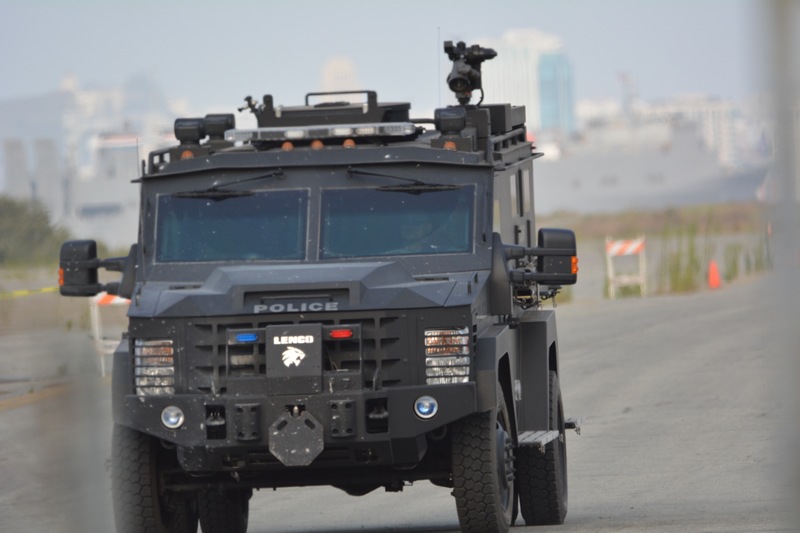 The video below includes footage of the hostage rescue exercise on the Alameda Point Nature Reserve. It’s early in the video (after the intro) showing an explosion next to an armored vehicle traveling along a road on the Nature Reserve and the rescue exercise next to a bunker. Urban Shield exercises on the USS Hornet Museum at Alameda Point are also featured in the video. There is nothing wrong with hostage rescue training. There is something wrong with the VA lying about how its property would be used. There is something wrong with gunfire and explosives detonations on an area supposedly set aside for wildlife. 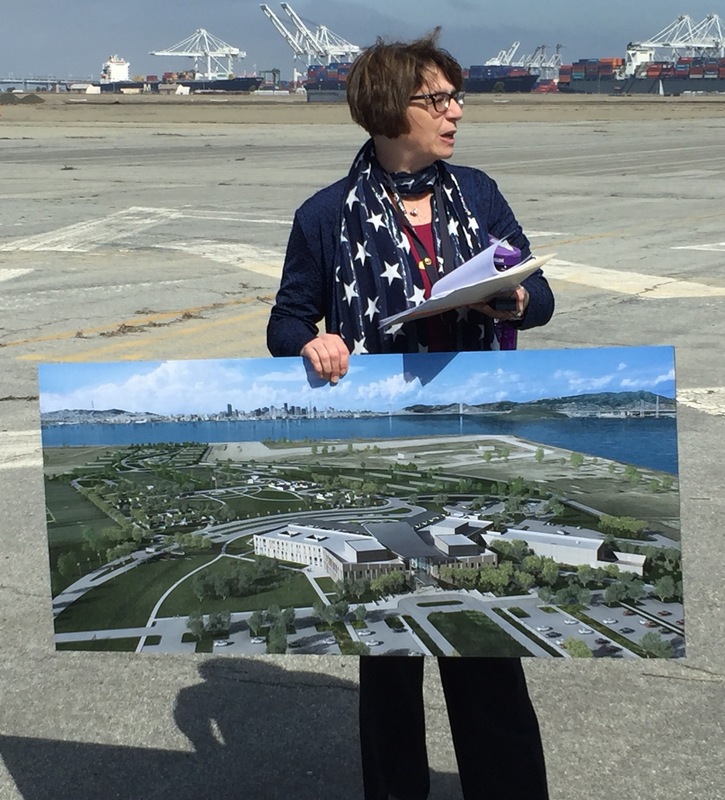 And there is something wrong with the VA turning its back on veterans who had been hoping the new Alameda Point health facility would be built by now. VA rep on the Nature Reserve talking about proposed health facility and columbarium in April of 2016. VA is still AWOL. A shorter version of this story appeared in the Alameda Sun. The highlights video explains _nothing_. Seems a waste if its objective is to impress the public or improve public relations.